Under One Roof was set up around fifteen years ago. Was the market ready for a pair of restaurant consultants, where husband Manu organized the food, wrote the menu and trained the chefs, while wife Sonia trained the staff and organized the bar menu? As Manu Mohindra said in their salad days, “We’re doing this while we’re young and don’t have the benefit of age or benefit of hindsight. Because if we did have experience, we’d probably not have rushed headlong into this field.” He was right. The term ‘hospitality consultants’ had not been coined in the late 1990s, and even if it had been, it is doubtful that the Mohindras would have used it to describe themselves. It was just a husband and wife team who worked with the zeal and tirelessness of a pair of fire fighters. They’d work on an American style café in Gurgaon one week, and the next week would set off for Chandigarh or Pune to set up another project. “If there was time for self-introspection, we’d probably have had misgivings,” confesses Sonia Mohindra, “but we were super busy those first few years, so we coasted along without much of a plan.” Coasting along was an excellent idea: in doing so, they were building a brand for themselves and garnering a body of work. Fifteen years and over 900 projects later, including 95 hotels, it is fair to say that there is nobody else in the country who have so many restaurants and hotels as clients, nor as wide a swathe as Under One Roof: from Jammu to Trivandrum and from Kolkata to Mumbai. They have set up hotels and restaurants of all sizes and have worked in Singapore, Dubai and Chicago. They have built fiercely loyal customers for whom they have set up Levantine restaurants, dhaba look-alikes, English cafes and chocolateries. They have set trends; increased their knowledge base to include facility planning, interior design, communications and public relations; branding and graphic designing; popularized the idea of shopping for furniture and kitchenware in Bangkok and Shenzen respectively and are numerically, far ahead of the competition. The office has expanded to include no fewer than seventy staff members, of whom some are chef trainers and bar trainers. 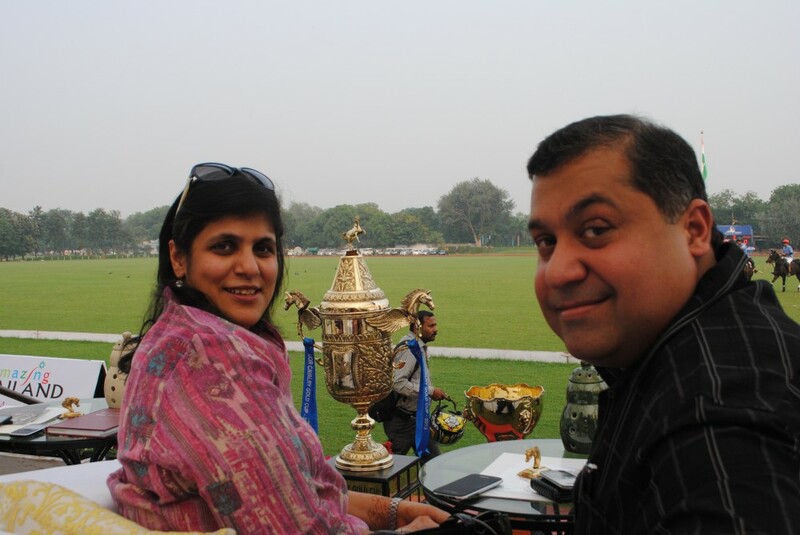 The polo season in Delhi, famously held throughout winter, had a new cup this October: the Under One Roof trophy, the first trophy sponsored by a food and beverage company. Both partners of Under One Roof – Manu as well as Sonia Mohindra – are from an army background, with Sonia’s father being in the 63rd Cavalry. So the love of the sport, the backdrop of having a Cavalry Officer for a father, the gentleman’s life, the highly trained horses and the marquee for evening tea all were strands that were woven together inextricably.